Conflict and human rights abuses have led to 3.4 million people officially registered as internally displaced (IDPs) in Colombia. The group of European Caritas agencies and Secretariado Nacional de Pastoral Social/Caritas Colombia visited the department of Córdoba from 25 to 28 October 2011. Their visit included the municipalities of Montería and Tierralt. During the visit, the group met with civil society organisations and church and community leaders. Caritas says the situation is as a result of the military confrontations between the army and illegal armed groups, including the FARC guerrillas, the so-called criminal bands and the groups that have emerged from the demobilisation of the paramilitary groups. 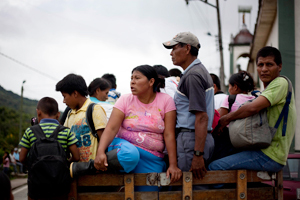 The number of mass displacements has increased in the past two years and the confinement of the civilian population continues, especially in the rural areas of Tierralta, Puerto Libertador, Montelíbano and Uré (sub-region of Alto Sinú and Alto San Jorge). The Caritas Working Group for Colombia are alarmed by the increased risks and threats faced by human rights defenders. Improve the efficiency of the State’s response to early warning systems and risk reports produced in the region. Ensure that foreign investment in the region promotes local development based on the respect for human rights and prior consultation of communities.